• Read a story together. Buy two copies of your favorite book or story (or borrow them from your library) and spend the evening discussing it. You may both learn things you didn’t know about the story (and each other). • Team up on a new recipe. 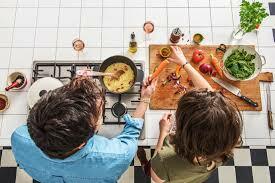 Instead of going out to a restaurant, delve into your cookbooks and find a meal to collaborate on. Choose something different and challenging, and enjoy the results. • Visit a museum. Your town probably has a museum (or two) that you’ve never been to before. Or a landmark you haven’t seen yet. Select someplace new and check it out together. • Go ice skating. If you live in a cold climate, find an ice rink nearby and go out for an hour or two of gliding—or falling—around together. Most rinks will rent skates for a minimal fee.